American President Barack Hussain Obama has fired Top American Army Commander in Afghanistan Gen Stanley McChrystal yesterday for writing a article in a Magazine in which he criticized top American officials. After dismissing Gen Stanley McChrystal Barack Obama has given Command of Forces in Afghanistan to General David Petraeus. 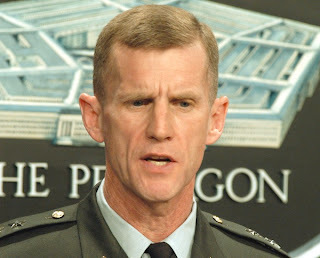 Barack Obama said he has fired Gen McChrystal because he has failed to meet the standards a Army General Should have. Obama also said that i have not made this decision because i have any difference in Afghan Policy with him. Gen McChrystal was one of the top US Commander who was in Iraq before Afghanistan where he fought against Al Qaeda.